zip file 을 적당한 곳에 unzip 하자. 여기서는 다음 path 를 이용했다. windows 와 관련된 아파치 설정과 관련해서는 ref. 1 을 보자. default 설정을 하나 back up 해놓자. 보통 backup file 이름은 httpd.conf.default 로 한다. 기본적으로 httpd.conf 의 ServerRoot / DocumentRoot / ServerName 을 설정해 줘야 한다. 기본적으로 httpd.conf 에 있는 c:/Apache24 로 되어 있는 값들을 현재 자신이 설치한 path 로 설정해 준다. VirtualHost 에 지정한 port 가 Listen 에 지정되어야 한다. 그점만 주의하면 크게 어려울 것은 없다. 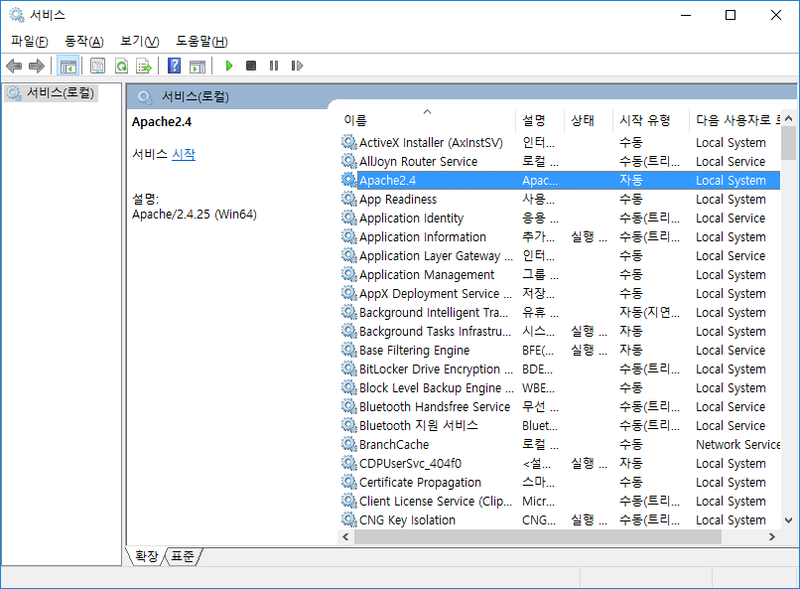 "Apache Service Monitor" 라는 이름으로 service 가 설치된다. 이름을 바꾸거나(-n), conf file 의 path 도(-f) 변경할 수 있다. 자세한 것은 여기를 참고하자. httpd 를 그냥 cmd 창에서 실행하면 된다.